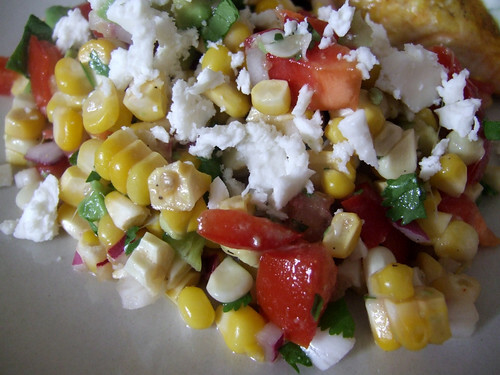 Corn remains to be one of my favourite summer vegetables. When sweet Ontario corn starts rolling into the markets, I always buy a bunch of them, steam them, and eat them as is. The sweet little kernels of corn as they burst in your mouth…why mess with a good thing? Continuing on with my salad diet because of the heat (the motto in my kitchen lately has been “minimal cooking required”), I decided to make a quick salad with some corn. Adapted from Maria’s recipe, this is such a refreshing salad that is delicious on its own, as a side to chicken or fish, or as a fresh salsa with tortilla chips. Every forkful bursts with so many different flavours—the sweetness of the corn and red peppers, the slight tartness of the tomatoes and lime, the spicy kick from the jalapeno and onions, the creaminess of the avocado, and the saltiness of the feta. Place the red onion in a small, non-reactive bowl. Give it a good pinch of salt and pour over red wine vinegar and a bit of lime juice. Set aside for 15 minutes as you prepare your other ingredients. 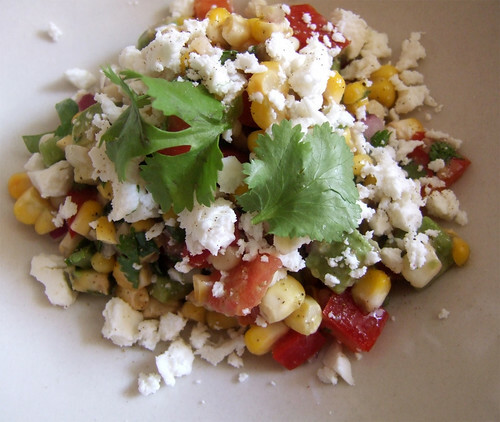 To the bowl of corn, add the tomatoes, red pepper, jalapeno, avocado, red onion and cilantro. Add the lime juice, as well as the liquid the red onions were soaking in, and stir. Season with salt and pepper. Sprinkle salad with feta cheese and gently stir. Serve cold. Posted by Bonita at 10:45 a.m.